Calling MBA candidate Amanda Akason "highly motivated" might be an understatement. As an undergraduate student, she played varsity soccer, served as president of the Student Athlete Advisory Committee, participated in a cappella choir and worked several campus jobs. She gained her B.S. in Business Administration in 2012, and knew she'd pursue advanced degrees. "After I graduated, I obtained a position as a Marketing Specialist at UW-Superior," Akason said. "I also knew that I wanted to obtain my MBA and one day my Ph.D., so after two years in this position, and extensive research, I applied for grad school at St. Scholastica." When considering options for her MBA, Akason considered cost, location, and most of all, recommendations from friends and colleagues. "Cost was a huge factor in making my decision. When I compared St. Scholastica's tuition to other local grad schools within the region, St. Scholastica came out as being most affordable […] and ahead in overall experience," she said. Now, near her MBA completion date, Akason has thoroughly enjoyed her time in the program, citing tremendous support from professors and students alike. "The professors are extremely helpful, understanding, and passionate about what they teach," she said. "The pace, while rigorous, is preparing me for writing my final thesis paper." In discussing her time in the MBA program, Akason also referenced the cohort model, where students take classes with the same group of students throughout the program. The model promotes an environment of encouragement and camaraderie, which is often missing in online or post-grad coursework. There's no stopping Amanda Akason — affectionately known as Mandee by most of her peers. Recently, she landed a job at Essentia, a recognized leader in healthcare delivery throughout the Northland region. Akason said her time in the MBA program prepared her for this opportunity. 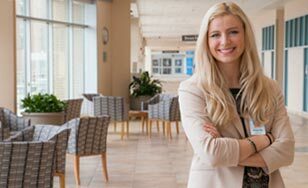 "To my knowledge, Essentia Health saw that I was continuing my education and believed I would be an asset to their Marketing and Communications Department," she said. "I hope that as I continue with my degree I am able to apply what I learn in my new workplace." Future plans? Oh yes, she has plans. "My five-year plan is to complete my MBA and continue working my way up in the healthcare industry, as well as begin to teach college classes part-time," Akason said. "My ten-year plan is to transition from healthcare marketing to healthcare administration as well as to begin working on my Ph.D."
All told, Akason regarded her time at CSS as rewarding and relevant — the same experience she believes other students will have. "I would most definitely recommend St. Scholastica for anyone who is looking to obtain their MBA," she said. "I have thoroughly enjoyed my experience thus far, and have gained knowledge and had experiences that are applicable to my current work." A brand new MBA starting Fall 2016 focused on developing leadership skills and effecting change.